The Watagan’s is a great place to spend a weekend or few more days hiking. 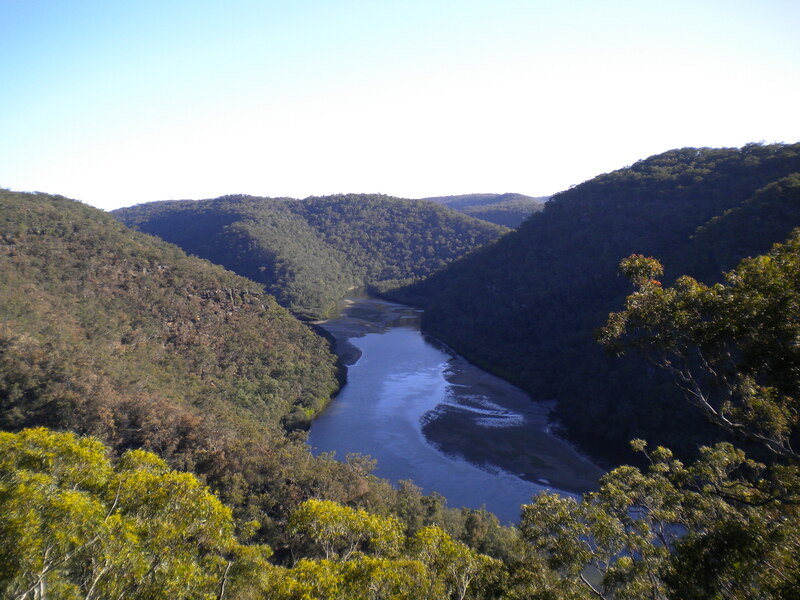 Situated just to the north of Sydney, it is a lush mountainous area full of wonderful flora and fauna. And what an awesome effort by nephew 5-year old Aubrey, he walked half of the 25 kilometre hike! And the Kiwi showed some great endurance carrying him and a 20-kilo pack the rest of the way! Mind you he did run 100-kilometres of this route just a couple of weeks back in 20-hours! The Australian Bush hey, you’ve got to love it. 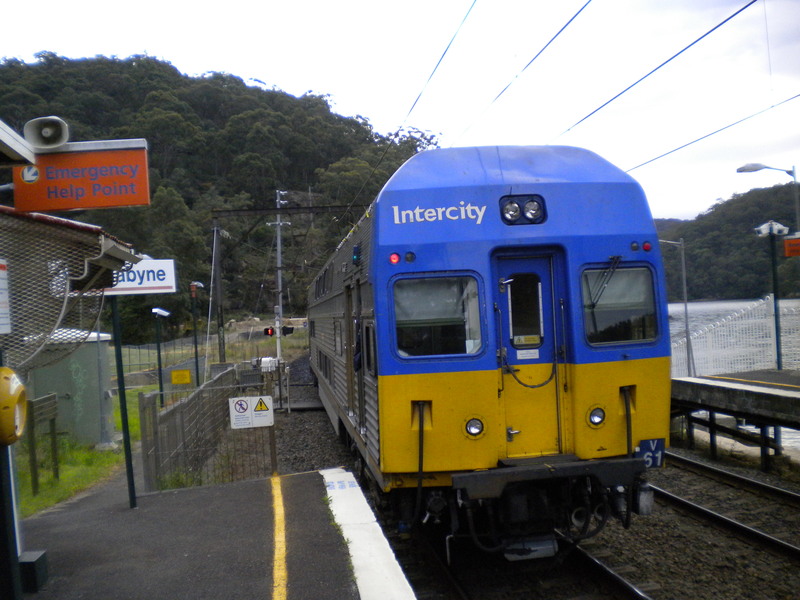 If you ever harboured an inclination to walk from Sydney to Newcastle it is worth knowing that the price of a one-way rail ticket is $18, the journey takes approximately two hours and it is a pleasant trip. On the other hand if you want to save the train fare and have around ten days to spare, then I thoroughly recommend you take The Great North Walk. The Great North Walk was constructed as a celebration of Australia’s Bicentenary in 1988. Brother-in-law, and fellow adventurer, Ray Tong, and I decided to save the train fare and walk. 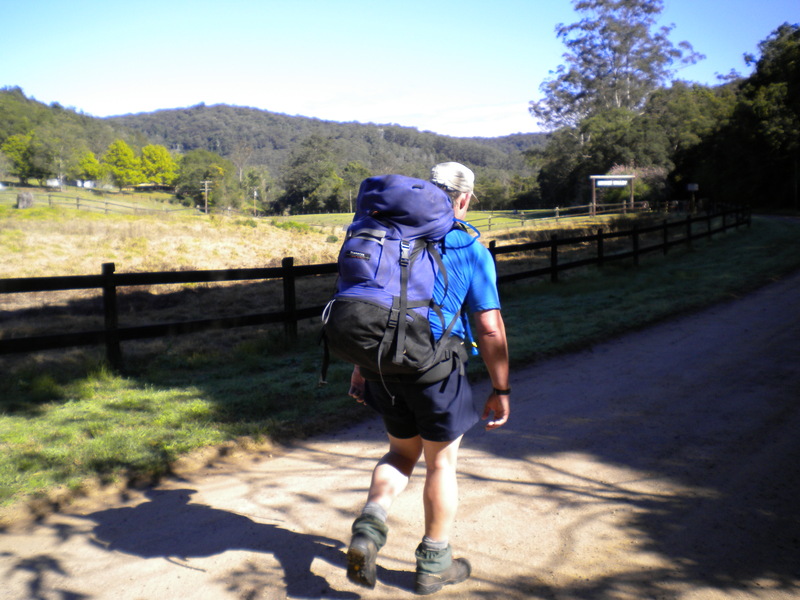 The walk commences in Sydney’s Central Business District and the first couple of days are spent walking through the inner and outer northern suburbs of Sydney, mostly along bush tracks, before arriving at the Hawkesbury River. 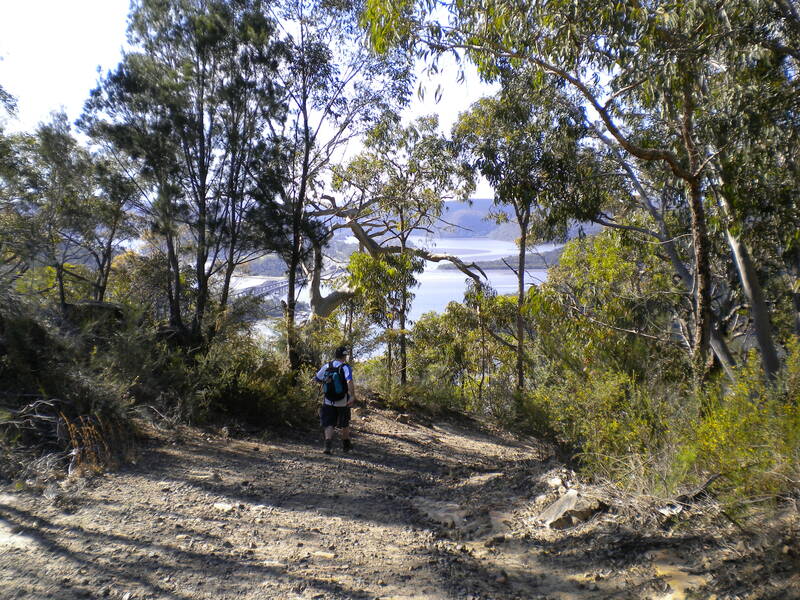 There are two ways to get to the other side of the Hawkesbury. One is via a ferry to Patonga, and the second on a train. We elected to take the train, and its departure marked our moment of truth as we stood there, back-packs loaded with twenty kilograms of gear and water, another seven days ahead of us. 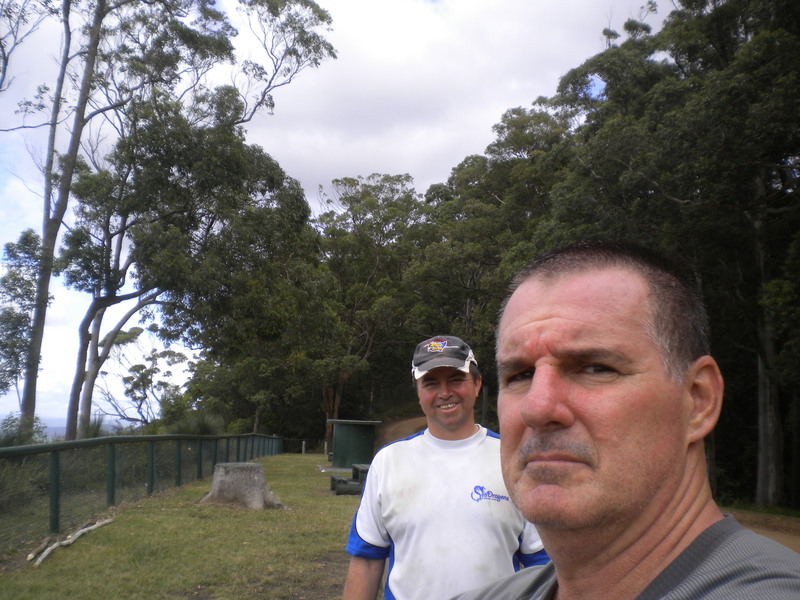 The half-way point of the walk was marked at the small locality of Yarramalong nestled in the Central Coast hinterland. And similar to previous this day it had its fair share of hills, gullies, and at times, open forestry trails. 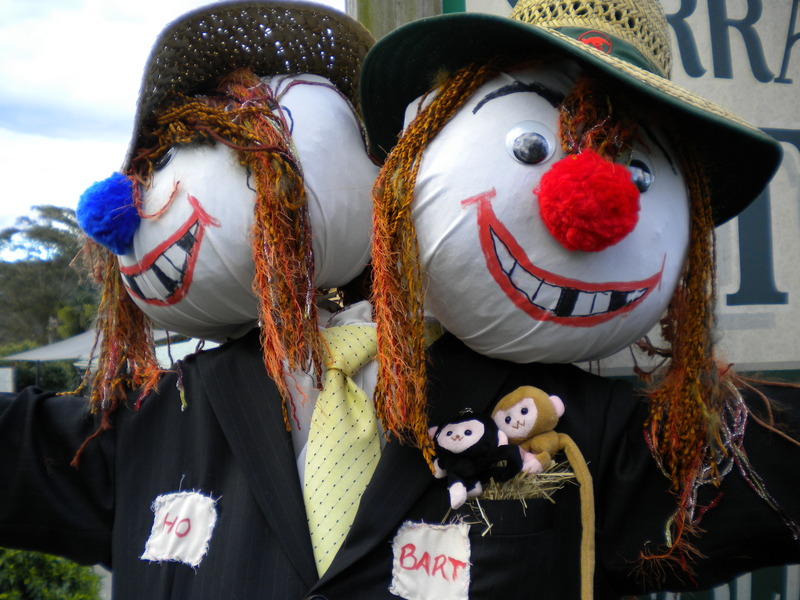 We were greeted to the sleepy township by a scarecrow at almost every house, part of the area’s welcome to spring celebrations. I’d venture to suggest that had we stood still many would have been forgiven for mistaking this couple of weary and dishevelled walkers as just another pair of scarecrows. As we turned in for the night Ray suggested the next day was going to be a real slog and that we should get an early start. But when the alarm clock went off a two-thirty something in the morning I was left to ponder, half comatose, just how far this days walk was going to be if we had to rise so early. It turns out the alarm clock in the next room, which was unoccupied, had been set for this time, and Ray was still blissfully asleep as I lay there listening to the mind-numbing sound for two hours leaving me an hour’s sleep before needing to rise and get underway on the day’s walk.. The walk took us along a quiet country road to Cedar Brush track head, the point from which we would launch our assault, and long climb, into the Watagan Mountains. After six full days on the walk you would think the hills would come just a little easier, especially as our fitness levels were increasing each day. 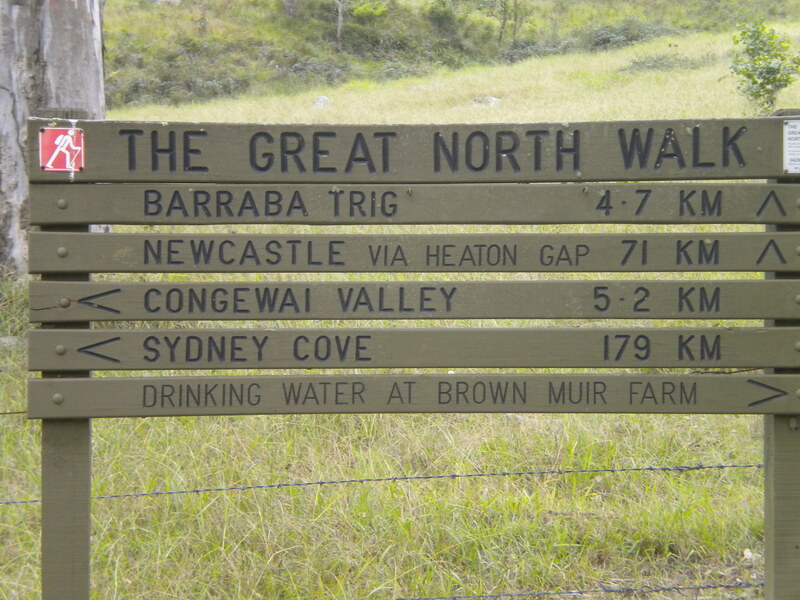 Our walk to Barraba Trig threw a number of hills and gullies at us, but it saved the best till last. This was an hour and half’s walk up the side of a hill that got steeper with every step we took. 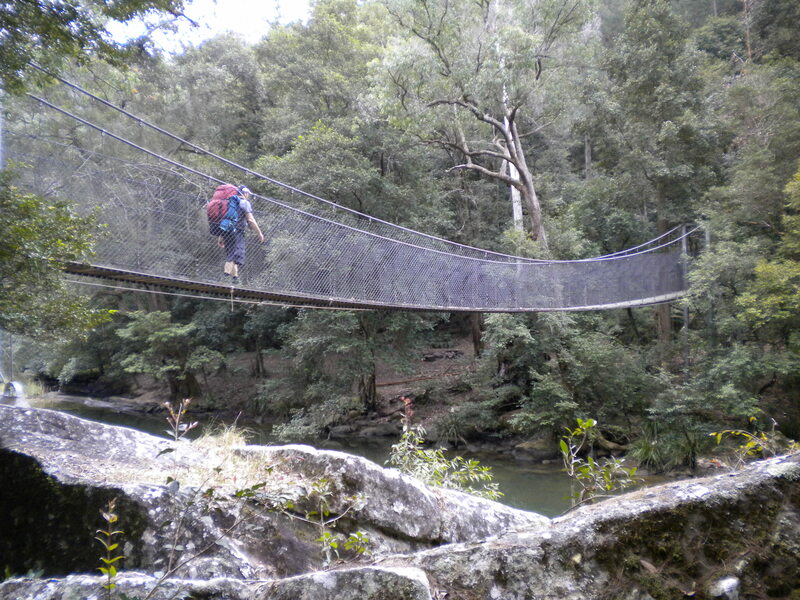 The Watagan Mountains is a beautiful place with many walking tracks and fire trails to be explored. 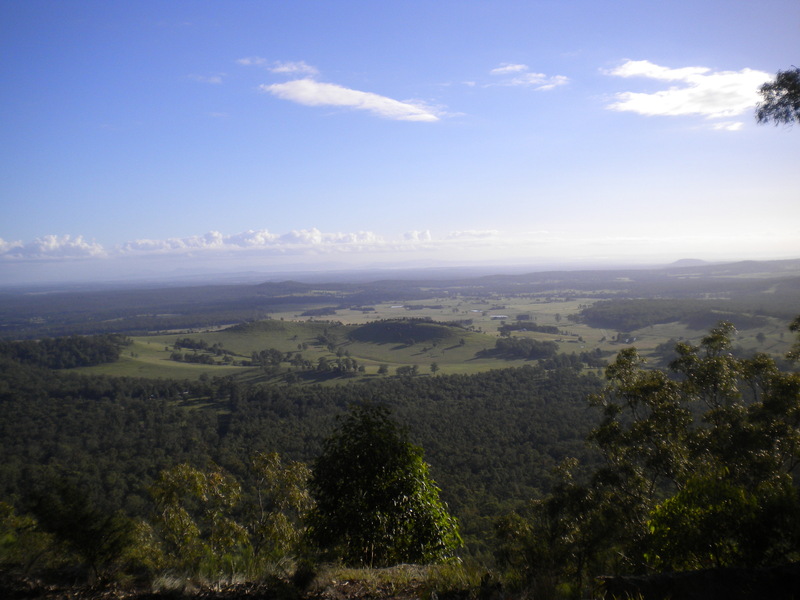 The view from our campsite was magnificent and took in parts of the Hunter Valley wine growing region. 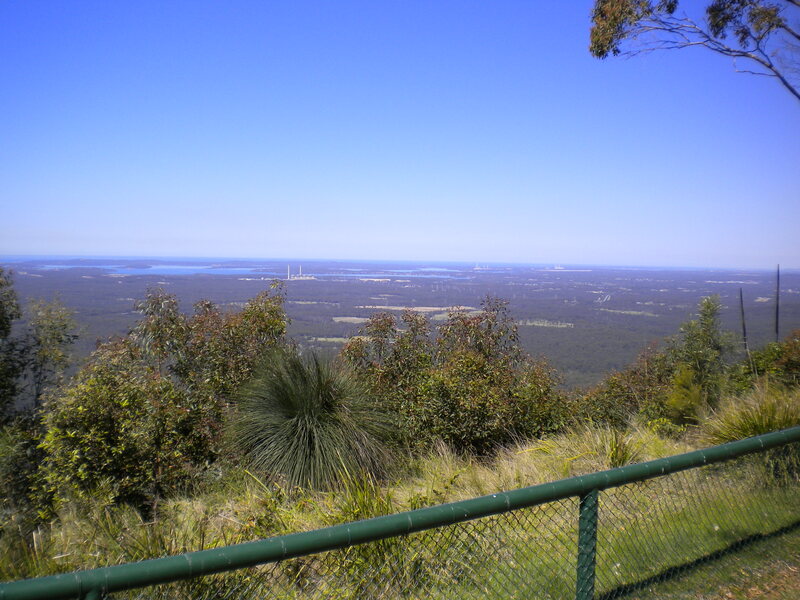 The next day was spent wandering in quiet contemplation along shaded fire trails before arriving at Heaton’s Lookout, and a wonderful panorama of the hinterland through to the ocean. From here we could even see our destination, a mere forty-five kilometres away. 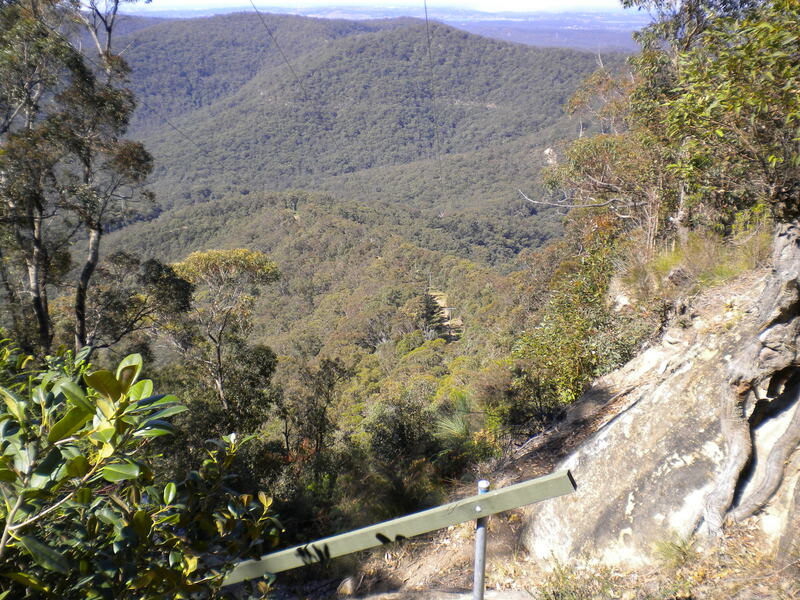 However, before we could wind down for the day and relax at the cabins located at Heaton’s Gap we had to negotiate our way down a steep power line track. The bottom of the hill would signify a couple of things though, a refreshing shower, and importantly, we would be rid of some of the gear out of our back-packs as we were to be joined by Janet, my partner, and our son TomO that evening. However, there is a downside to most things, and over dinner Michael casually mentioned that with the sign suggesting it was only forty-one kilometres to the Brewery Pub at Newcastle, yes the walk finishes at a pub, that we should give consideration to knocking it off tomorrow instead of over the planned two days. There was an awkward, but silent moment, as Ray and I caught glances, and Michael with a hint of a wry smile on the corner of his mouth recognised the bombshell he had just dropped. I thought, that confirms my thinking, and Ray had a look of disbelief and no doubt was hoping that I hadn’t actually heard what Michael had said. But the penny had dropped! The next day we were greeted to a lovely sunny spring day and with a hug and a kiss from Janet and TomO we headed off on what was to be our last day on the walk. Oddly, there was no discussion of Michael’s suggestion; I didn’t want to raise it too early, and Ray surely didn’t want to remind me of what Michael had said. But like an irritating blister on the heel of your foot I raised it with Ray just as we walked into what was supposed to be our night’s rest spot at Warner’s Bay. There was an animated discussion at that point. 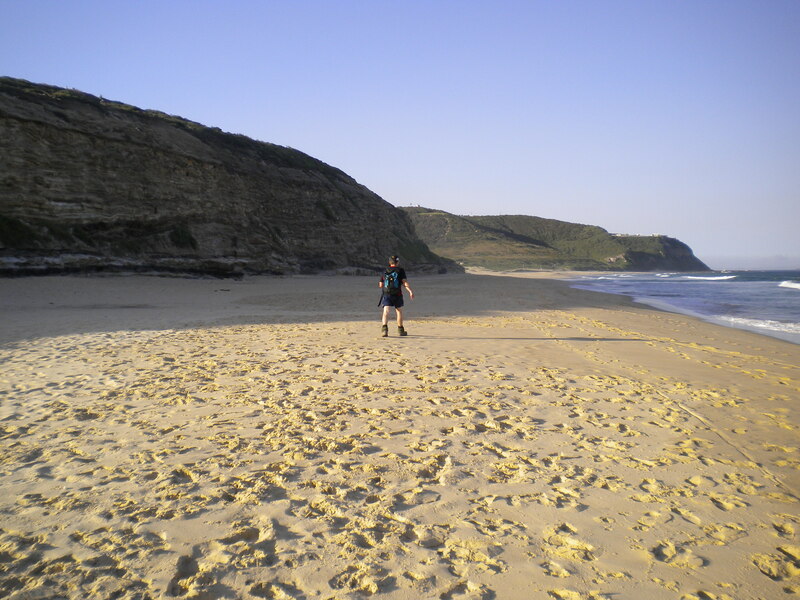 But to his credit, Ray, a Kiwi, pushed through the pain of his blisters, egged on by my promise that I would have us sitting at the Brewery Pub downing a pint of lager as the sun set over Newcastle harbour. And was the nine day walk worth the saving of an $18 train fare – you bet it was!